Much of our success is due to the family's long-time relationship with trainer/breeders Chris and Sonya Bickford of Sherwood, Oregon. Dedicated to breeding athletic, tall, willing, English pleasure horses. 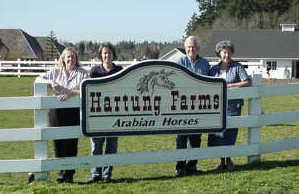 Our family Arabian horse farm, which we have owned and operated since 1958, is located in Cedar Mill (near Portland) Oregon. Our enthusiasm began with English lessons for the five Hartung children and continues through all phases of our active horse farm. Danskalima is in foal to Bask Flame and due in June 2001. All of our horses are descended from mares Nasr Ribala and Takara Rifalima+. We are proud to see steady improvement in our horses while retaining the traits of the original two mares that our family loves. We are especially pleased with the great chestnut stallion Bask Flame #0175602 and the champion bay stallion Ga-Serafey #0062458. The Hartungs began in 1960 with one 1/2 Arabian 1/2 Morgan black mare, Chloe. 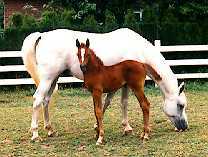 They purchased the mare Nasr Ribala #0017076 (Buna x Alla Ribala) in 1968 and the mare Takara Rifalima+ #0049102 (Takara Rifha x Alima#007860) in 1974.